There are so many ways to make a cute hair bow! 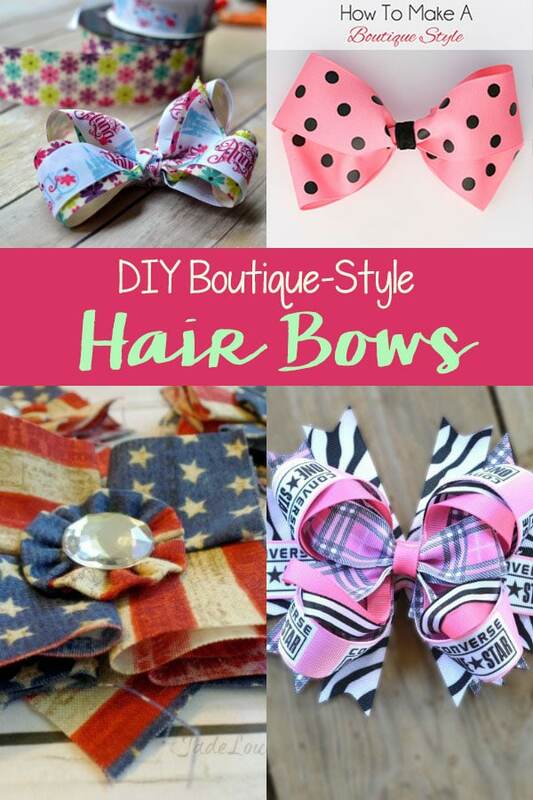 If you are looking for DIY boutique style hair bows, you have come to the right place! Here are several great tutorials to choose from. How to Make a Boutique Styled Hair Bow | Midwestern Moms – Recreate this fabulous, simple boutique-style hair bow, that’s no sew. It has a simple step-by-step tutorial to follow, and is great for beginners! Twisted Boutique Hair Bow | The Ribbon Treat – Create a twisted hair bow with this tutorial. This tutorial includes a sizing chart to create whichever size you want. It is made with a hair bow maker, but you may be able to make it without one. How to Make a Boutique Bow | Always Under Pay – Created with one string of ribbon, this tutorial is easy and elegant for a simple boutique style hair bow. How to Stack a Boutique Bow | Sews N Bows – For a vivacious flair, create this stacked boutique bow! You can layer different colors or styles for this bright head piece. DIY Layered Spike Boutique Hair Bow | My Love of Style – Combine a Spiked Hair Bow with a Pinwheel Hair Bow to make this super cute bow. How to Make a Tails Down Boutique Bow | The Ribbon Retreat Blog – With the its “tail down” – create this boutique bow made with a solid color. It’s made with a ribbon bow maker, but can probably work without one. How To Make A Hair Bow | Little Birdie Secrets – These hair bows are incredibly versatile, and can be made with a variety of different colors and sizes. Hair Bow Tutorial | Skip To My Lou – With a little gem in the center, this hair bow can be created as simple or as decorative as you’d like! Boutique Bows, DIY Patriotic Patchwork | Busy Creating Memories – This unique hair bow is made with a shabby chic and patriotic feeling. Its colors are red, white, and burlap mixed with a fun gem in the middle. DIY Felt Hair Bows | Style Your Senses – These small hair bows are made with felt, and their petite nature is perfect for a newborn. It has some free templates, and the cost is only about $.50 per bow! Big Girl Boutique Bow Tutorial | Hair Bow Center – This classic layered bow is about six inches long, with loops standing tall at about three inches. Shabby Chic Boutique Hair Bows | Doodlecraft – A hair bow with a shabby chic flair, this bow is made with felt, elastic, and can easily be placed on a headband or clip! After checking out these great tutorials, which one is your favorite? Thanks so much for including my tutorial! Great roundup??? ?